Open Streets K'Rd 2016, which took place last Sunday, was Auckland's biggest street event of the year, with an estimated 30,000 people in attendance. 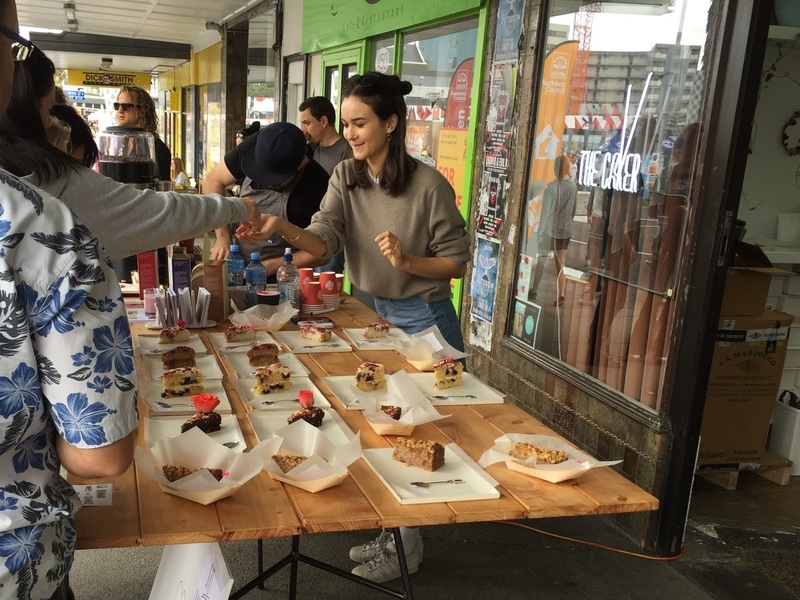 For the first time in 10 years, nearly the entire length of Karangahape Road was free of cars, from Upper Queen Street to Ponsonby Road, so it was a vast improvement on last year's Quay Street event. Apart from not having traffic constantly in the background, K'Rd just has more character, with street art, historic arcades, and little shops and restaurants. Plenty of people, but still space to move. The event organisers have done a fantastic job, thoughtfully spacing out the entertainment, stalls and rest areas across six different zones. It was great seeing things you don't normally come across, such as street furniture made from road accessories, interactive artwork like giant dominoes, and people and transport of all forms. Street furniture from tyres and road barriers. The savvy restaurateurs set up feeding stations on the street, rather than expecting people to wander in. Apero, for instance, had sandwiches you could grab and go, as well as a $50 meter sausage you could take home to cook. Apero offered pre-prepared sandwiches, hot dogs and takeaway items. It was also a great opportunity to taste things you wouldn't otherwise have had a chance to try, like a little slice of The Caker's baking ($6), which is normally sold as pre-ordered whole cakes. Not surprisingly, plenty of pictures of these turned up on Instagram. Variety of cakes slices from The Caker. There was an underground market with vegan food stalls in the Whammy Bar, which I would never have realised was there, but fortunately I had heard about it via Facebook. If I could change one thing about Open Streets this year, it would be to have a website where you could find out about these related events. Vegan food at the underground Whammy Bar. I was lucky to be able to try Shasha's green jackfruit gulai curry, served with toasted spiced coconut and grilled marinated tempeh, which sold out shortly after. Green jackfruit curry from Nusantara Indonesian Tea Cafe. Back on the street, music venue Neck of the Woods had the biggest queue waiting for their international street food, which included whitebait fritters, gua bao and chilli cheese hotdogs, each for a very reasonable $4. At the other end of K'Rd, Madame George put on a Peruvian BBQ, which we were now too full to sample. 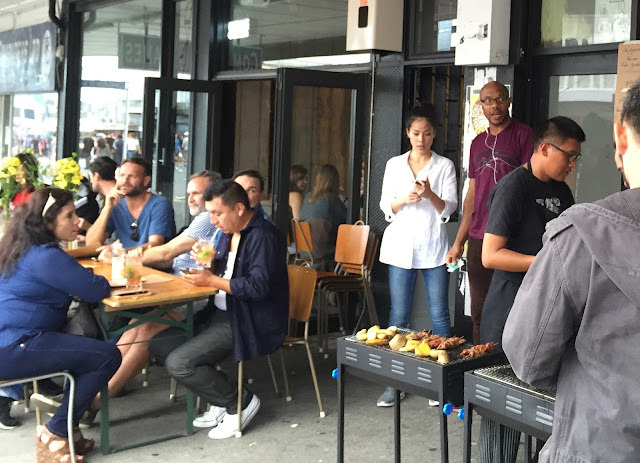 Outdoor Peruvian BBQ at Madame George. Even businesses which weren't located on K'Rd itself set up stalls; Le Garde-Manger sold out of all their galettes by the afternoon, but people were happy to wait for their sweet crepes. Only sweet crepes left, but the crowd doesn't mind. Our original plan was to turn up for lunch, go home for a bit, then come back for dinner. But actually, there were so many things to see and do that it was easier just to hang out on K'Rd the entire time. For instance, there was an impressive pole dancing performance from Lucky Thirteen outside Coco's Cantina, which alternated with other shows (we saw a couple of jugglers in that spot as well at different times). Others made art while you watched. Andrew J Steel first decorated a box, then got into it and proceeded to paint kids' faces while peering out through a little hole. The Quick Draw Sketch Gang did impromptu portraits of people. For those who were itching to do something physical, there was a soccer match, or you could work on your coordination with the diabolos, hoops and other equipment provided by the Circlability Crew, who made it look easy juggling clubs and riding a giraffe unicycle. It was great seeing how the businesses on K'Rd got behind the event too. Matchbox Studios ran a workshop on how to make watermelon pompoms, which made me stop even though I was on the way to food. Workshop on how to make watermelon pompoms. People obviously loved Open Streets so much that they were still partying after dark. It's great that our city has events like this, and I can only imagine it will be even better next year!